GAROWE, Puntland - Road maintenance project to rehabilitate part of Garowe-Galkayo corridor in Somalia's northeastern Federal Member State has been completely suspended over corruption and irregularities, Garowe Online reports. The EU funded project and supervised by a German-based organization, Deutsche Gesellschaft für Internationale Zusammenarbeit (GIZ) faced shortcomings after a local company called Is-Xilqan, which won the contract failed to meet the expected standard and requirement. A leaked document obtained by Garowe Online revealed that collusion between Puntland government partner agencies and the contractor over Conflict of interest has prompted the entire suspension of the road rehabilitation project. The document further indicated that malpractice and corruption are the among the factors led to the suspension of the EU-funded road maintenance project in the region. Is-Xilqan, a Mudug based privately owned construction company has been selected to implement the project aimed to rebuild an 80Km road between Jalam and Harfo villages, with 48 Culverts and drains installations and renovation of 80 old bridges. The first stage of the work began with Surface leveling of the Burtinle-Harfo road, which is estimated 20Km, equivalent to 14.5% of the required work and the local company failed to proceed to asphalt lay down and repairing the damaged bridges. The deadline set for the completion of the project expired in December 2017 and has been extended to May 2018 by GIZ which is responsible for the supervision. GO has learned that the fund for the implementation of the project will expire in June if it not utilized. Long-running dispute and lawsuit are said to be the root causes of the total suspension of the project activities. 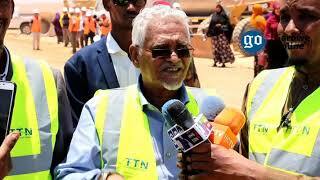 GIZ believed that the local agencies, which Puntland government has assigned to the work are wrongly defending Is-Xilqan construction company. A) Poor quality of work which is not acceptable to the supervisors, such as low-quality sand filled in the road surfacing stage and the contractor has brought the wrong machinery that made poor crushed stone or gravel below the aggregate size of 85 percent. 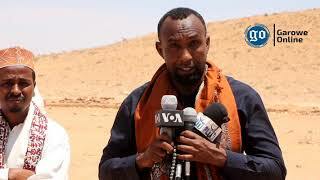 Members of Puntland Engineers Umbrella told GO that there are a doubt and fear of replacement of the sand currently delivered to the site of construction of the 20Km road after it lost moisture and cohesion due to exposed sunlight and wind in more than 5 months period. B) The materials of the asphalt lay down and the construction of the bridges which the company previously promised is not partially in hands and now out of the country. C) Is-Xilqan company has failed to hire talented and skilled road construction engineers, including five regular foreign Engineers as per the agreement, instead, it employed a project manager and three low-level workers. Ali Nur Afrah, the project manager was brought from the United Arab Emirates [UAE] while the rest are from the camps for the Yemeni refugees in Bosaso is the commercial city of Puntland, northern Somalia, according to the confidential leaked document seen by GO. D) The International donors are reportedly angry over the Puntland government's failure of its role in the implementation of the project and falling short of the promises it made during the signing of the agreement. The deal includes cutting trees and construction of the diversion road as the 80-kilometer Jalam-Harfo road was under construction and bringing Engineers and survey team check the quality of the sand and gravel. These violations came after attempts by the contractor to force the supervisors to approve Payment for Services not yet done and increase the number of the employees to work on the construction project. 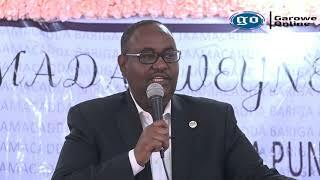 Due to lack of transparency and accountability in the work has united the team that Puntland government has tasked with the quality control and Is-Xilqan company who are said to be connected to the State Presidency. Critics accuse the project manager Ali Nur Afrah, Director of Puntland Highway Authority [PHA], Abdirizak Yusuf Elmi and Abdirizak Elay, who is a representative of the project for Puntland President Abdiweli Mohamed Ali "Gaas" of having close links with the Presidency. PHA which is mandated to supervise all rehabilitation projects of highways in Puntland has fired quality control Engineer, while another resigned and left the job who were paid by GIZ after resisting illegal orders. Ahmed Said, known as [Jafar] and Dini Abdirizak Jama, who later resigned from the post over displeasure with the process of implementing the road rehab project. A fact-finding team from the EU arrived in Garowe, the capital of Puntland last week and met separately with PHA executives, senior government officials and local community members over the alleged fraud allegations. 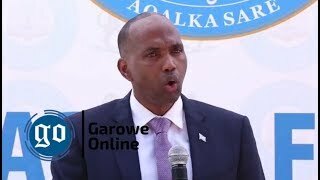 On arrival, the committee visited PHA headquarters in Garowe city but was denied access to meet with the officials and workers by the Agency's managing Director, Abdirizak Yusuf Elmi, according to the sources. After contact with PHA office, European Union team met again with Elmi and other persons not concerned to the issue at Grand hotel at a night time instead of the Agency's employees and expected people such as the project manager, Ali Nur Afrah, Abdirizak Elay, and Chief of Staff Abdinasir Bihi. 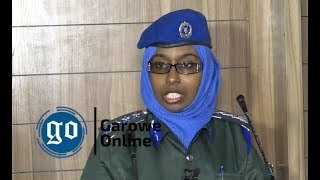 On the second day, the team left Garowe for Burtinle district to meet the contractor and employees, charged with carrying out the work, but, they were followed by unwanted members such as the former PHA Director. 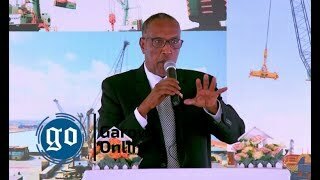 There are reports indicating that Puntland President Abdiweli Mohamed Ali "Gaas" will be traveling to Kenya to meet the European Union countries funding the road project. No date has been set for Ali's trip. Since he came to power in 2014, President Ali and his term-ending government were calling for new infrastructure projects in the region despite lack of ample policy to effectively manage and maintain this projects.